By Mark McGrath, October 2015. If you want your boss to invest more in your web presence you need to make a sound business case for web development. Managers quite often don't see the need to spend more on a website. Yet as the preferred communication channel for most people to do business they should. To convince them though you need to make a business case for both the development and the cost required to complete it. Over the years I've lost count of the number of clients that have said to me, "I really think we need to redevelop our website, but my boss thinks it's a low priority and won't allocate us any money to do it". When the web was new and it's real business value open to debate, you could understand (but maybe not agree with) the view, "we've already got a website, it may not be perfect, but it's adequate and we've got more important things to spend our money on at the moment". But that view only held currency around 10-15 years ago when web services weren't that sophisticated and people's confidence in e-commerce was low. Since then there's been an explosion of online take-up, e-commerce and bandwidth that shows no sign of abating. In short, the world has gone online and made the web their preferred medium for news, information, entertainment and doing business. As a result, we are witnessing the decline and transformation of print media and free to air TV as we know it. For nearly every organisation nowadays, their website is their most important public presence and communication channel. Why? Because the majority of their audience prefer to use the web to engage with them instead of the telephone, face to face, TV, radio or any other communication channel. For those who work day-to-day in the online world, this is obvious. But you would be surprised how many senior managers still don't get this. How do you change their mind? So if you have a boss reluctant to invest in web development, how do you change their mind? Most if not all senior managers want their organisation to be the best in their field. If you can show them that this currently isn't the case with your website then this can be a powerful motivator to support a development program to improve your website. A professional web consultant would be best placed to perform this analysis. But if you are prepared to do some self-directed learning, you could do a reasonable job of this yourself. Does their layout work better on tablet and mobile devices than yours? Is it easier to find what you want? Does their copy read better? Do they offer web services yours don't? Is there useful content you could offer that either of you currently don't? Your answers here should indicate where your website needs to improve so that you can at least match or better your competition. If someone has to transact business with an organisation, they don't want to ring up and be put on hold for an unknown length of time. Nor do they want to get in the car and drive to do an over the counter transaction, if they can avoid it. Not surprisingly, what they would prefer to do is go online, at the time of their choosing, and get the business done quickly and without hassle. There is no longer any excuse for organisations not providing equivalent services online. Forms can be submitted online. Documents can be signed and uploaded online. Payments can be made online. Everything you can do via paper can be done online. In many cases for less cost than equivalent offline transactions. So your website needs to be able to provide all of the services your organisation does via other channels such as telephone, post or over the counter. A useful exercise is to audit all of the transactions your organisation provides via other channels and then compare these to the services your website offers. Whatever gaps you find in your web services should become part of your website development agenda. It may be that your website is underperforming. Failing to reach as many people as it should and deliver services to them. If that's the case, then you have grounds to argue for more investment in the development and marketing of your website. How many people is your website currently reaching? How many people could your website reach? Are you doing any online marketing to attract users to your website? How effective is this online marketing? Answering the first question should be easy if you already have an analytics program monitoring your website such as Google Analytics. Accessing an analytics program will tell you how many people (users) your website reached over the last year. But if you haven't then you can still extract website performance data from your log files, and possibly import it into an analytics program. Consult your web provider or a web consultant for advice on this. The second question can be more difficult to answer and usually needs some research. But it can be done. First, you need to define your target audience as best you can in terms of location, age, interest or any other demographic you think is relevant to the services you are offering. Then once you have defined your target audience, you need to use some statistical resources to estimate the population of your target audience. After that, you need to apply some assumptions about the level of website usage to come up with a meaningful number of people that could be expected to visit your website. A worked example may help you understand this technique better. Over a year, 30% of ratepayers would have a need to contact your council. Of these, 50% would prefer to do it online. The average number of times your council is contacted by these people over a year is 1.5. 20% of website visits are not ratepayers. 70,000 (ratepayers) x 0.3 (% contacting council) x 0.5 (% preferring online access) x 1.5 (number of visits) x 1.2 (20% extra users who are not ratepayers) = 18,900 visits. If you have difficulty in estimating the size of your target audience, then a good resource is Facebook's advertising engine. This engine allows you to define your target audience by location, age, interests and education. You can then apply a factor to compensate for the fact that not everyone is on Facebook. It's estimated that 40% of Australians are on Facebook 2. This equates to a factor of 2.5 to convert the Facebook figure to the general population. A further factor of 0.85 could be applied to this figure to account for the number of people with online access. Is your organisation doing any online marketing to promote your website and the services it offers? If the answer is yes, then you need to look at each initiative and gauge the effectiveness (see below). If the answer is no, and your analysis of target audience shows that you are reaching significantly less than what you could, then you have a clear case for investment in online marketing. How many users are ads delivering to your website (say, over the last 12 months)? How much did this advertising cost? How many of these users have performed what you wanted them to do (e.g. sign up, join, subscribe, contact or buy)? This is what is known as conversions. How much did each conversion cost? How much revenue did all these conversions generate? How much revenue did each conversion earn? If you use Google Adwords and Analytics and sell products or services online, then you can easily answer all of these questions (by setting goal pages, linking Adwords and Analytics accounts, and tracking ad conversions). Most online advertising services offer analytical tools to measure performance, so you should follow up on these services and implement them. If it's the case that you are spending more money on online advertising, than what you are earning through these ads, then you may need to re-evaluate and re-engineer your advertising mix. If you are earning more money than what you are spending on online ads and are fulfilling your daily advertising budget most days, then this is a clear case that you should be increasing your online advertising spend. What are the biggest frustrations you have with our current website? Are there any particular aspects to the website that make your job harder? Are there any particular aspects to the website that limit your ability to service your target audiences? Can you suggest any improvements to our website? What you are looking for here in the responses are cases where website development could address issues and improve staff productivity or service to your users. Identifying difficulties in using an unfriendly Content Management System (CMS) can provide good grounds for investing in a new, more efficient CMS. If a web manager on $60,000 pa, making an average of 10 publishing operations a day, could save on average just 2 minutes per publishing operation with a better CMS, this would produce an annual saving of $3,350 to the organisation. Surveying your target audiences on the quality of your website can provide valuable justification for investing money for further development. Ideally, you should already have a website satisfaction survey built into your site, so that user feedback is collected on an ongoing basis. But if you haven't then you can create a website survey and ask your users to complete the survey. Your website survey questions should be based on good web usability principles (heuristics) and not be too long. If you are not sure how to do this then you should consult a web professional who has experience in doing this type of work. If creating a web survey form on your own website is problematic, then alternatively, you can always use a free or low-cost survey service such as SurveyMonkey. If you already have a list of contacts (eg members, subscribers, customers or supporters) who represent your target audience then you may be able to invite them to complete the survey. If not, then you are going to have to market your survey using a combination of promotional content on your own website and online advertising (eg Google Adwords or Facebook). In either case, offering incentives to complete the survey, such as a prize draw is a good tactic to achieve an adequate response rate. A member-based organisation I conducted a website survey for, achieved their highest ever survey response rate (by more than triple the previous best) simply because for the first time, they offered 5 iPads as an incentive to members to complete a 5 minute survey. This is worth doing because quite often organisational websites outperform other communication channels in terms of sales or service delivery, with minimal investment in development and relatively lower operating costs. This is explained by the history of the web and the time-lag between the take-up of web services and managers becoming aware of this take-up. In the early days of the web, cost of development, availability of transactional services (being able to do business online like apply, join, register, buy and pay) and the use of the web were all low. All of this justified low investment in the web by senior business managers. It was a new, immature communications channel that didn't warrant serious investment. But since then a lot has changed. Most people have broadband access and do business online, making the web the most important communication channel for organisations. But unfortunately, many senior managers (typically of non-commercial organisations) still have not caught up with this change and still spend a relatively low amount of money on their website, as if it was the old days and not their number one communication channel to do business. So to change this thinking you need to conduct a financial performance analysis of your communications channels. The idea here is to try and get a handle on how much business is conducted through each communication channel. How much revenue is collected via each channel? For example, what are the total sales made from telephone, post, over the counter and online channels? What is the annual return on investment (total sales divided by total costs expressed as a percentage) on each channel? * Better still, applying a total cost of ownership model averaged over 5 years (set-up cost + [annual costs x 5] / 5) would give you a truer picture of the costs of each communication channel. Below is an example of what this analysis could typically look like. You can see from this example that the website is earning $4.28 for every $1 spent on it per year. Plus, the website consumes only 19.3% of total annual operating costs for all communication channels, yet achieves 55.4% of all sales. In this case, you could strongly argue that an investment in development would be justified, especially if you had also identified deficiencies that could be addressed by development. By conducting this sort of analysis, you can then identify if your website is out-performing other channels. 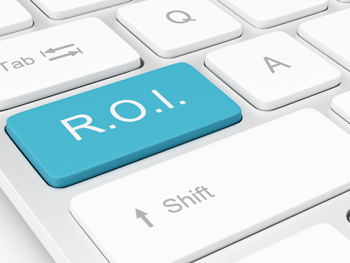 If your website is earning more per $ spent on running it compared to other channels (a higher return on investment) then you have a good case for further investment in development. If your website is not earning more than it costs to run then you should identify the reasons why, such as lack of e-commerce capability or poor marketing. If you are a commercial organisation selling products and services then this analysis should be easy to do. But if your are a non-profit or government organisation that delivers services to the community that are not always charged for or charged at below commercial rates, then this is a harder task. One way to overcome this difficulty though is to assign a points value to each service and then to calculate a points per $ spent score for each communication channel. The following example can help make this clearer. Let's say you are a service based non-profit organisation. Below is the range of services you provide with a points rating allocated to each service. The points value for each service reflects its worth to the organisation. By applying this points schedule to all service transactions over the past year, you could produce an analysis like the following table. If you are an organisation that provides a mix of paid and free services then you can adopt a hybrid approach that is a mix of the two above. For free services, estimate a notional $ value for each service, then calculate the notional total revenue for each channel. For paid services, calculate the total revenue for each channel. Then add these two total together to produce an overall total revenue figure. Once you have framed a development agenda and determined the financial performance of your website, you need to make the case for investment. This is essentially an internal marketing campaign. Like any successful marketing campaign, it needs the right messages delivered through the right channels to the right people. Deficiencies of the current website (drawn from your competitive analysis, website performance analysis, staff consultation and user survey). How these deficiencies are harming sales, service delivery or productivity (drawn from staff and external user surveys). How your recommended development agenda can address these deficiencies. Why this development is money well spent (drawn from your financial performance analysis). A well-written, concise business paper that argues your case in detail. A powerpoint presentation that summarises key points of your case. A meeting of decision-makers to present your case. It's best to write this business case up in a paper and present it to management in order to win a positive decision. Better still, circulate a draft to staff, asking for feedback, refine the draft and then ask key staff to support the paper. Obviously the person in charge of your web development budget is the right person and key decision-maker to target in this campaign. But there are other people you should consider too. Key staff; team leaders who are prepared to support your case ("advocates") by endorsing your paper. Any other people in your organisation that the key decision-maker listens to ("influencers") and that you think you can co-opt. All of this sounds like hard work. Because it is. Furthermore, if you are going to embark on web development then you should be doing most of this research anyway. No change is easy. Business managers need to be convinced before making a change. But if you put the work in as suggested then you will have a sound business case for the investment you need to improve your website and its performance. 1. Australian Bureau of Statistics, 8146.0 - Household Use of Information Technology, Australia, 2012-13. 25 Feb 2014. http://www.abs.gov.au/ausstats/abs@.nsf/Lookup/8146.0Chapter12012-13.